Déménagement en provenance/direction de Lawrence, KS? Les remorques fermées et carrossées de U-Haul sont ingénieusement conçues pour protéger et retenir vos biens précieux, alors que nos remorques ouvertes sont idéales pour tirer des matériaux de construction ou d’aménagement paysager et des articles de gros volume. Les remorques pour voiture de U-Haul sont dotées de rampes à chargement facile pour un chargement sans effort des véhicules, alors que nos remorques pour moto sont légères et faciles à remorquer. Obtenez GRATUITEMENT des estimations de tarif pour la location de remorque à Lawrence KS 66049 dès aujourd’hui! Les remorques fermées à Lawrence, KS sont légères, aérodynamiques et conçues pour offrir une plus faible consommation de carburant, facilitant le remorquage. Chaque année, des millions de familles utilisent nos remorques carrossées pour déménager. U-Haul offre une vaste sélection de remorques carrossées à louer dans la même ville ou pour un aller simple. Consultez les tailles de nos remorques fermées et réservez en ligne une location de remorque chez U-Haul of Lawrence! Les remorques ouvertes sont idéales pour le remorquage de charges grosses ou surdimensionnées à Lawrence KS 66049. De nombreuses remorques ouvertes sont louées avec une rampe de chargement pour plus de commodité. La sélection de remorques ouvertes offertes chez U-Haul of Lawrence représente une solution abordable pour des projets d’amélioration résidentielle, la livraison de meubles ou le remorquage de véhicules récréatifs. La location de remorque ouverte est également populaire auprès des entreprises pour la livraison et lors de salons commerciaux. Les remorques ouvertes sont offertes en une variété de dimensions et de styles afin que toutes les voitures puissent les remorquer. Have the gas tank at least half full. Pricing was not clear. Paid a lot more than expected. Good customer service. I needed to extend my rental and they were great setting me up. Fast checkout and check in. After moving/driving all day I drop off my truck at my original drop location in tonganoxie ks only to be told by the uhaul rep I called the tonganoxie ks location did not accept after hours drop offs. The rep selected another drop off location in Lawrence ks off kasold drive which was open and kindly added milage to my minimal 68 miles I was originally afforded. I arrived at the Lawrence ks drop location off kasold drive, nice place and plenty of trucks and other rentals. One of the workers took the keys and went to look over the truck. He took awhile to come back, red flag, then when he did he told me there was a crack in the windshield. No problem, I've got SafeMove insurance for $14 I purchased on pick up. Then he tells me SafeMove doesn't cover windshield damage, only the SafeMove Plus does. Everything I read online and was given indicates SafeMove "damage coverage" covers pretty much all non-gross neglect damage, exception bring transmission failure, fluid losses, flat tires, getting stuck, etc, but no where under the damage coverage exclusions details does it exclude windshield cracks. Bad way to end a busy day. I kept my cool and told the guy I didn't think that's right my damage coverage didn't cover what uhaul says on their website is one of the most common types of damage that occurs (windshield cracks) and requested him to go ahead and submit whatever he needed to submit. Overall end feeling was I got scammed and am on the hook for a new $1000 windshield, that was my walk away feeling. We were only like 15 miles out of Lawrence, Ks., when the drive shaft fell completely out and was on the road. After making several phone calls, we were still stranded for 4 LONG hours! I only received a partial refund. I will think twice before ever using U Haul again!! None. Everyone I interacted with was very helpful. I take issue with the fact of not being warned at time of online reservation, that would show a REQUIRED return time of 3:00PM of the day of rental, would thus REQUIRE me to pay for another full day of rental. See Reservation Number 20027168. Now upon pickup at 8:45 AM on the day, it was shown to me on the contract a returned time of 3:00PM. While I accept this as a notification, at that time. However the attendant verbal told me that should I return the unit after the store closure that day, I would not be charged for another. Keeping in mine, I have over 30 years of experience with U-Haul as a customer, this is the FIRST time I have been told that a 24 Hour rental is basically equal to 6 Hours. As I pickup at 8:45AM and would have required return by 3:00PM that day. Or in this case 9 hours as I returned the unit after 6:30PM. While after a brief discussion with the attendant, this issue was resolved. To the expectation that was set at time of reservation and pickup. I would caution you to make changes to the online reservation system showing this, to avoid ANGRY customer in the future, either at time of pickup and drop off. All the people working there are very nice and helpful. They make it a pleasure to use that location. Be honest with customers and uhauls bank should not make customers wait 5 to 7 days to get their deposits back when they take the money instantly that's bad business will use Penske next time I'm done with uhaul. Professional in every sense of the word. The taxes are are too high. I arrived at my predetermined time to pick up the truck so I could move. I encountered a ton of problems. 1. App would not allow me to get the code to complete the rental and start early. 2. was on phone with customer service for 1 hour with no resolution except by the time they were trying to get somewhere, the store opened. 3. I was able to get the truck quickly once the store opened. However the point was to get it an hour earlier thus taking an hour away from my time. 4. Returning the truck. It stated on my contract that the tank was to be on F. however when I rented the truck it was on 3/4 of a tank not full. Then when trying to get re-compensated for the gas the dollies were taken off the bill. (however on my invoice it does not look like they were. According to the person I spoke with. they could do nothing about the gas issue, so I feel like I got taken for gas I should not have had to purchase. I will never rent from Uhaul again due to these problems. I'm also going to recommend that my friends and family no longer patronize this or any uhaul location as to the practices seem unfair to people that abide by the rules. There was a lot of "I'm sorry" from people but at the end of the day that does not make the customer feel any better then what they were feeling. Your new policy of checking in on an email to go over final aspects of renting is a very bad idea. My email did not open to the link at hand and I gave up and did not bother with it. Standing before your employees at your store and they could do nothing to finish the process because I had to go on my phone and email, is curious and misguided in my opinion. Upon my return, an older gentleman was renting a utility trailer and one of your service team members mentioned he didn't even have a cell phone and didn't know what to do. My advice is to not trust clients to A) have a smart phone B) cell phone service is tricky at your locations and C) particularly if you have a problem while in transit and you have no internet service for email. Senior sin particular do not have super smart phones and they have no way of dealing with this new policy change. Good guys working the local store however. I let them know the truck I had pulled to the right and they said thanks for letting them know so they could get it fixed. Other than that I didn't have any issues. I'd go back. Quick and easy to lease vehicle. They need qualified peoole to take reservations. I had to drive to kansas city and back for a car transport trailer. Because they gave me the wrong one. Added 2 hours to a 9 hour drive. I can’t think of anything. All the employees were extremely helpful and very nice to work with. 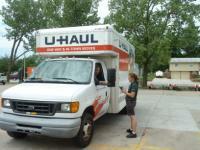 The Uhaul employee that helped us, Alex, was very helpful and it was a pleasure doing business with him. Easy friendly folks. Very helpfull. Staff are great here, their attitude is cheerful, kind, understanding and professional. I always rent here.